The Sopwith triplane was designed to provide the widest field of vision and maximum maneuverability. In their search for an outstanding fighting airplane, the Sopwith experimental department decided in early 1916 to build an entirely new design—a triplane. The completed machine had three narrow-chord wings with a combined wing area to provide plenty of lift. Ailerons were fitted to all three wings; the interplane struts were plain but strong and few bracing wires were needed. The fuselage was a typical Sopwith wooden box girder. Tail-plane, elevators, rudder and fin resembled those of the Pup, but later production models had a tail-plane of reduced area. The handling qualities of the Triplane were excellent. It is now regarded as only slightly less maneuverable than the Pup, but many pilots preferred it to the little biplane. The triplane layout was adopted in order to give the pilot the widest possible field of vision, and to ensure maneuverability. The central wing was level with the pilot's eyes and obscured very little of his view, and the narrow chord of all the mainplanes ensured that the top and bottom wings interfered less with his outlook than the wings of a biplane. The narrow chord aided maneuverability, for the shift of the center of pressure with changes of incidence was comparatively small; this permitted the use of a short fuselage. At the same time, the distribution of the wing area over three mainplanes kept the span short and conferred a high rate of roll. It has been said that Anthony Fokker was so anxious to produce an aircraft which would be an adequate reply to the new Sopwith fighter that he resorted to subterfuge to obtain an example of the Triplane. He contrived to arrange for the delivery to his works of the remains of a Sopwith Triplane which had been shot down, despite the fact that the aircraft should have gone to the German experimental field at Adlershof. However, the Fokker Dr. I Triplane which was ultimately designed by Reinhold Platz, Fokker's chief designer, was a very different aeroplane from the Sopwith Triplane. The power unit, a 110 hp Clerget rotary, was eventually replaced by the 130 hp Clerget. The standard armament consisted of a fixed Vickers gun, synchronized to fire through the revolving propeller. A small batch of six Triplanes, however, were fitted with twin Vickers guns built by Clayton & Shuttleworth. The first prototype Sopwith Triplane, N.500, went to France in mid-June, 1916 to undergo Service trials with Naval "A" Fighting Squadron at Furnes. The Triplane was an instant success, and no time was lost in testing it in action, for it was sent up on an interception within a quarter of an hour of its arrival at Furnes. It was destined to be flown operationally by naval units only. The R.F.C., who had already received a present of the first sixty R.N.A.S. Spad S.7s, decided in February 1917 to accept the remaining sixty in exchange for the Sopwith Triplanes on order for the Corps. Clayton and Shuttleworth-built Triplane flown by No. I Squadron, R.N.A.S. The type was ordered by the Admiralty for the R.N.A.S., and the War office followed suit by ordering 266 machines for the R.F.C. Sopwith built the R.N.A.S. Triplanes. Other contractors undertook production of the Triplane for the R.F.C. No. 1 (Naval) Squadron, 'Naval one', went into action with the type in April 1917, in support of the hard-pressed R.F.C. The hitherto very successful Albatros D-III was completely outclassed, and IdFlieg , the German Inspectorate of Flying Troops, received a severe shock. The Tripehound could out-climb and out-turn the Albatros, and was 15 mph faster. Naval Eight and Naval Ten, equipped in April and May, also made their presence felt. Proof of the Triplane's worth was soon to be shown. In April 1917 Flight Commander R. S. Dallas and Flight Sub-Lieutenant T. G. Culling attacked a formation of fourteen German aircraft. After forty-five minutes they had shot down three of the enemy and driven the remainder into retreat. On June 6th, thirteen of Naval Ten's Triplanes fought fifteen enemy aeroplanes and shot down five without loss to themselves. Two of the five were Albatros scouts which fell in flames under the fire of Flight Sub-Lieutenant Raymond Collishaw. Other famous R.N.A.S. pilots who scored heavily with the type were Collishaw, Little, Booker, Reid, Sharman, Nash and Alexander. 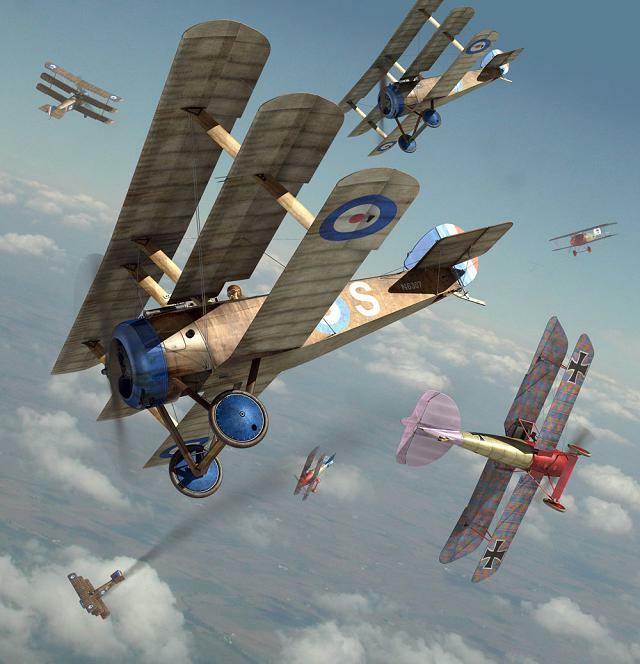 Collishaw was probably the best-known exponent of the Sopwith Triplane's superb fighting qualities. A Canadian, he was given command of "B" Flight of No. 10 (Naval) Squadron on April 1st, 1917. This was the famous "Black Flight", as redoubtable a fighting unit as took the air during the war. Between May and July, 1917 it accounted for no fewer than eighty-seven enemy aircraft. All the pilots were Canadians. The original members were Flight Sub-Lieutenant E. V. Reid, Flight Sub-Lieutenant J. E. Sharman, Flight Sub-Lieutenant G. E. Nash, and Flight Sub-Lieutenant W. M. Alexander. The Triplanes of the Black Flight were named Black Death, Black Maria, Black Roger, Black Prince and Black Sheep. In a combat on June 26th, 1917, Nash was wounded and forced down behind the enemy lines by Lieutenant Allmenroder, a German pilot with thirty victories to his credit. Next day Collishaw avenged the loss of his friend. In a fight which began near Courtrai, he shot down and killed Allmenroder, forcing his green tailed Albatros to crash on the outskirts of Lille. In twenty-seven days during June, 1917, Collishaw shot down sixteen enemy machines. All, except three, were Albatros and Halberstadt single-seat fighters. N.5431, at Mudros in the Aegean. Some difficulty was found in obtaining spares for the Triplane during the summer of 1917, and one unit, Naval one, had to reduce its establishment from eighteen to fifteen aeroplanes. By the autumn the type had passed its zenith and the rate of casualties in Triplane squadrons rose. At the end of August, 1917, No. 10 (Naval) Squadron began to re-equip with Sopwith Camels. Three of its Triplanes were then transferred to No. I (Naval) Squadron, which in turn gave up its beloved Triplanes on its withdrawal on November 2nd, 1917. The first Triplane squadrons to begin re-equipment with Camels were No. 8 (Naval), which had received a few Camels by the end of July, 1917, and No. 9 (Naval), which exchanged its Triplanes and Pups for Camels between mid-July and August 4th. The Battles of Ypres were therefore the last actions over which Sopwith Triplanes flew. They fought with distinction until their final demise. When it is realized that only about 150 were built, it is surprising how much they influenced the trend of design. A host of triplanes and quadruplanes were built by the leading German and Austro-Hungarian aircraft manufacturers in efforts to match the performance of the remarkable Sopwith Triplane. N.5486 serving with the Imperial Russian Air Service. One Sopwith Triplane, N.5431, was used in Macedonia. It was on the strength of No. 2 Wing R.N.A.S., and in March, 1917, it was allocated to the new R.N.A.S. unit known as "E" Squadron, which later combined with a Royal Flying Corps detachment to form the Composite Fighting Squadron, based at Hadzi Junas as a countermeasure to the German bomber squadron then operating from Hudova. However, N.5431 never reached Hadzi Junas. It flew first to Stavros; and, in company with four Sopwith 1 1/2 Strutters, set out for Salonika on March 26th, 1917. Its pilot was Flight Lieutenant John Alcock. When landing at Salonika, Alcock made one of the few errors of judgment in his distinguished flying career. He overshot the small aerodrome and wrecked the Triplane. The wreckage was taken back to Mudros and rebuilt. It was still flying from Mudros at the end of September, 1917. On the 30th of that month it was flown by Lieutenant H. T. Mellings when he shot down an enemy single-seat fighter seaplane. Another, 'Tripe' No. N5486, went to Russia and was eventually provided with skis for operating in the snow. One 110 hp (82 kw) or 130 hp (96 kw) Clerget rotary, radial engine. One synchronized Vickers machine gun mounted centrally on top of the fuselage, firing forward. Several Triplanes had an installation of twin synchronized Vickers guns. Created April 17, 1997. Updated November 7, 2013.